Could a shift toward legal systems that recognize rights of nature actually happen in today’s world? It already is. 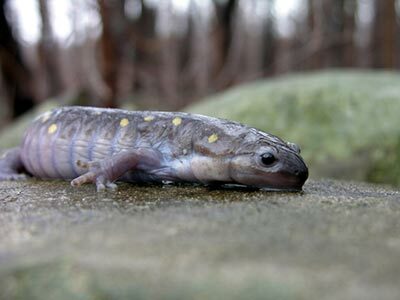 Earlier this year, in the Spring Equinox issue of Leaf Litter, restoration ecologist Mike Trumbauer shared a sad tale about a spotted salamander (Ambystoma maculatum) who discovers that his annual route to a vernal pool for breeding—the same route he and his ancestors have traveled for years—has been blocked because humans are building a road. Though the salamander eventually finds a detour, we are left with the sinking feeling that the road signifies the beginning of the end of that salamander, his subpopulation, and probably the vernal pool. Sadly, Mike’s story was not make believe. It is just one example of the millions of injustices suffered by nature in the name of human “progress” and “development.” But what if that salamander actually had legal rights, like the right to exist and to maintain its life cycle? And let’s take it further and ask, what if that salamander’s rights superseded the rights of a provincial government to build a road…or of a corporation to drill, frack, or dump? Could a shift toward legal systems that recognize rights of nature actually happen in today’s world? It already is. There is a movement underway—the Rights of Nature Movement—and at both grassroots and global levels, it is gaining traction. In 2008, Ecuador adopted a new constitution which recognizes the rights of nature. 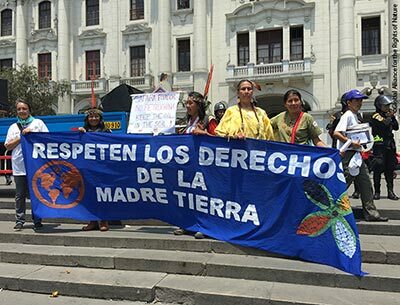 In 2010, the President of Bolivia hosted the first People’s Conference on Climate Change and the Rights of Mother Earth, where a Universal Declaration of the Rights of Mother Earth was crafted. And, thanks to the efforts of the Global Alliance for the Rights of Nature, an organization profiled in Leaf Litter’s Non-Profit Spotlight, there is even an International Rights of Nature Tribunal. Meanwhile, individual communities around the world are taking matters into their own hands and crafting local laws and ordinances to protect the rights of endangered species, specific ecosystems, and even nature in general. In the article Where the Rubber Hits the Road: Grassroots Momentum, we highlight a few of them, including the city of Santa Monica, California, which passed its own Sustainability Rights Ordinance two years ago. In her review of David Gessner’s book All the Wild That Remains, Landscape Ecological Designer Jennifer Dowdell examines the ways in which the beauty, majesty, and vastness of the landscapes of the American West have influenced the work of writers Wallace Stegner and Edward Abbey. We also share loads of resources related to the rights of nature, and some suggestions on what you can do to support the movement. As with every issue, we introduce new members of our team and catch you up on the latest news from Biohabitats. For some people, the idea of nature holding inalienable rights triggers an intrinsic, emotional cue that we’re onto something right and just. For those of us struggling with the psychological impact of being “in the know” when it comes to environmental degradation, the Rights of Nature Movement offers hope. That is why Biohabitats recently became a member of the Global Alliance for the Rights of Nature, signed the Rights of Mother Earth petition, and chose to dedicate an issue of Leaf Litter to this topic. We hope you enjoy it.